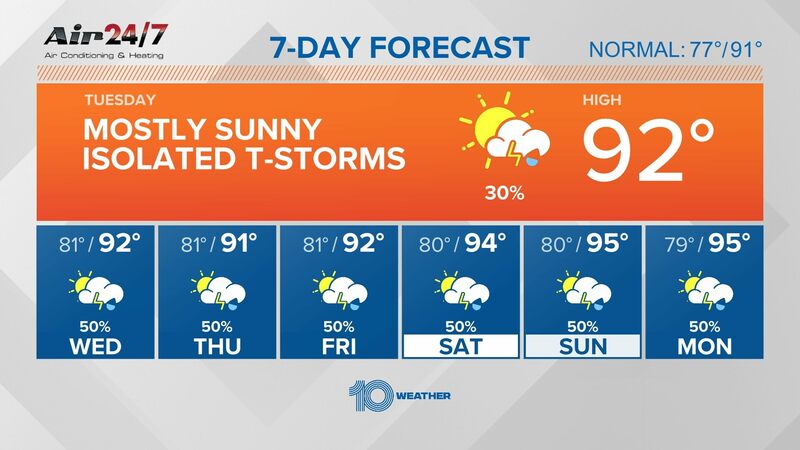 • Don't get your hopes up too much for significant rain today, but there's a 30 percent chance, according to 10Weather WTSP. 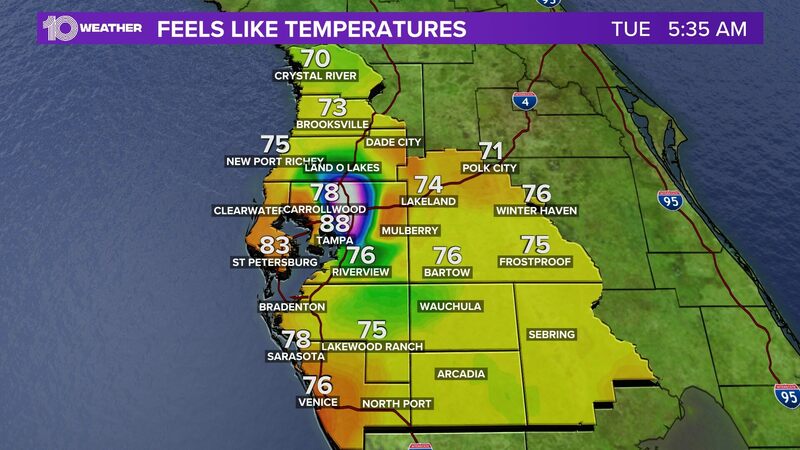 The high today will be 77 degrees, with a low of 67 as a cold front moves in tonight, leaving less humid conditions for Tuesday. • Fifty years after Tampa made him a star – heck yeah, we're claiming it – Neil Diamond, backed by a band of a baker's dozen on a four-tiered Vegas-style bandstand, repaid the city with two career-spanning, hanky-tugging hours of his biggest hits. Read Jay Cridlin's review. • Barack Obama's extended post-presidential vacation ends today as he return to Chicago for his first public event as a former president. And yet, Obama's supporters, who have been waiting eagerly for the former president to respond to his successor's accusations and policy reversals, are likely to be disappointed. • Hillsborough's population has more than doubled since Sheriff David Gee started at the department, to 1.4 million. An additional 600,000 people are projected to move here in the next 25 years. From the ground, residents can feel the gradual changes growth brings: crowded strip malls, longer commutes and, some complain, a slow erosion of a quieter way of life. But the sky offers an opportunity to see sprawl in real time, and indeed the bird's-eye view of Hillsborough's latest development spurt is stark. The sprawl strains Hillsborough's resources and services, Steve Contorno writes. • As connoisseurs of classic, Tampa-style Cuban sandwiches will tell you, lettuce and tomato on a Cuban is controversial at the least, and downright blasphemous in some circles. So Alton Brown, James Beard award-winning cookbook author and star of Food Network's Good Eats and Iron Chef America, was a little taken aback to find both on a Tampa-bought Cuban on Friday. Check out what he had to say during his Tampa show. • The St. Petersburg City Council's prolonged discussion Thursday night to formally request that Pinellas County allot an additional $14 million to the Pier District, downtown transportation and parking eventually ended with a compromise that passed by a vote of 5-3. The next vote might not be any easier: Will the council's carefully crafted resolution persuade the Pinellas County Commission to dedicate even more money to the already $66 million Pier? Waveney Ann Moore has the details. • Today is Holocaust Remembrance Day, and there are observances being held around the Tampa Bay area, including free admission today at the Florida Holocaust Museum in St. Petersburg. • Today through Friday, you can hear talks by local scientists in pubs and coffee shops around Tampa Bay for the Taste of Science festival . Here's the lineup of the speakers this week. Reservations are suggested, because they often sell out in these small spaces. We talked to some of these scientists about their work and about Saturday's March for Science in Washington, D.C.
• A new video from the USF Divest coalition of students, faculty and alumni urges administrators to stop investing in a number of industries that they don't support like BP, tobacco companies, weapons manufacturers and private prisons. PolitiFact Florida wanted to check out if USF really invests in those industries. Read the analysis later this morning on tampabay.com. • International Space Station commander Peggy Whitson today will break a U.S. record for accumulated time in space. President Donald Trump will call Whitson from the Oval Office at 10 a.m. to congratulate her. Here's how to watch the 20-minute White House-to-space station conversation. • Congress returns to work today to confront health care legislation and a budget deadline that's dramatized by the prospect of a battle between President Donald Trump and Democrats over his border wall promise. The symbolic 100-day mark approaches on April 29. That's the day when the government, in a worst-case scenario, could shut down. But House Speaker Paul Ryan told his members Saturday that the leadership has a plan to keep the government open. • Author and educational psychologist Michelle Borba delivered an important message at Thursday's annual Frameworks luncheon, sharing how it's never been more important in this increasingly self-absorbed world to instill empathy in our youth, columnist Ernest Hooper writes. • It's time to plan your week! Here are the top things to do this week in Tampa Bay, including the Sunscreen Film Festival bringing Hollywood stars for screenings, the Red Hot Chili Peppers and top athletes running the St. Anthony's Triathlon. • Most of us know that wine and beer are fermented. Yogurt and some cheese, too. But the notion of wild fermentation — the act of creating ideal conditions for bacteria then sitting back and letting them work their magic on food or drink — is trending in the Tampa Bay area, spawning new businesses and growth opportunities for existing ones, as well as cooking classes and festivals. Read more from food editor Michelle Stark.